Tablet turns the world of historical research upside down; cites ancient Jewish warrior "Judah Maccabee"
An independent historian from the small northern Negev city of Arad has turned the world of historical research upside down with controversial new research published in a Danish journal. The article authored by Dr. Linda Zollschan, which appears in Classica Et Mediaevalia, the Danish Journal of Philology and History, Volume 63, proves a long-gone bronze tablet displaying ‘friendship’ between Rome and Israel’s Jews did indeed exist. The research has overturned previous assertions to the contrary. Ancient writers – Josephus, Justinus and Eusebius – have all made reference to the fact that the Jews received “friendship” (a technical term for diplomatic ties, just below formal diplomatic relations) from the Romans. Memory of this event was preserved through oral and written tradition into the Middle Ages on a bronze tablet that once hung in the Church of San Basilio in Rome, says Zollschan in her article. “The bronze tablet had been well known, for it was remembered after it had disappeared from sight and given attention in the Mirabilia, a guidebook which had wide currency and was still being reprinted and used into the sixteenth century,” Zollschan explains. That it was inscribed on bronze defines it as an inscription that had significance in its own right, and that it was not used as building material, as were so many stone inscriptions, she adds. Its text, which contained mention of Judas Maccabeaeus — Judah Maccabee – gave it a religious significance, reminding the viewer of Judah the warrior, aided by G-d, who succeeded against overwhelming odds in his battle against the Syrian Seleucid army. Till now, most historians in the field have believed the tablet – which has not been seen in centuries – was only a myth confused with one inscribed in stone. “There are several indicators to be considered that speak for the tablet’s authenticity,” Zollschan argues in her article. “Overlooked in previous treatments of this bronze tablet is the relevance of its location ... in the ruins of the Temple of Mars Ultor in the Forum of Augustus, a temple which had served as the ‘Foreign Office’ of Rome. Its contents recording friendship between the Roman and the Jews was the type of information that would have been inscribed on a bronze tablet and hung on a temple wall in Rome. “This friendship was just the type of diplomatic relations that many of the ancient sources also report was cemented as a result of the Jewish embassy to Rome in 161 BCE. Bronze was the typical medium for the setting down [of] the text of decrees of the Senate and recording diplomatic relations,” she explains. There were other details that afford ample proof of the tablet’s existence as well, she argues, despite the fact it no longer physically exists. “The bronze tablet was mentioned in 1140 and continued to be known in the sixteenth century when the guidebook was still sold to pilgrims coming to Rome,” Zollschan explained in her article. Several hundred years later, there was still a Jewish connection. “The land on which the now dilapidated church stood was granted by Pope Pius IV in 1562 to the Dominican order of nuns, who built the the Monastery of SS. Annunziata. 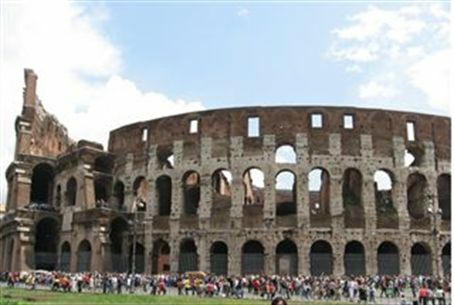 They had sought property in Rome to house Jewish girls who had converted to Christianity and who wanted to live as nuns under monastic vows, but had nowhere to go because other monasteries rejected them on account of their Jewish ancestry,” she continued. “Converts were given accommodation and girls were lured to convert by a gift of 50 scudi for a dowry so that they could marry. The church found for them a suitable Christian partner. Those who did not marry became nuns.